Close up of marquee sign. An interactive response wall asking visitors to describe their connection to the neighborhood. The overall prompt was "My Connection to Station North is..." and the subcategories were "I grew up here..." "I work here at..." "My favorite place to meet my friends here is..." "I went/go to school here at..." "I remember when..." and "This is my first time here and..."
I worked most closely with artist Jason Hoylman, who is a painter/sculptor and recorded his and friends/neighbors/colleagues movements throughout the neighborhood over a three month period. Here is an installation shot of his final artwork which included a large map of Station North and greater Baltimore. An installation shot of final artwork by Jason Hoylman. Inspired by magic cubes, Hoylman chose to represent each participant with a cube and number. 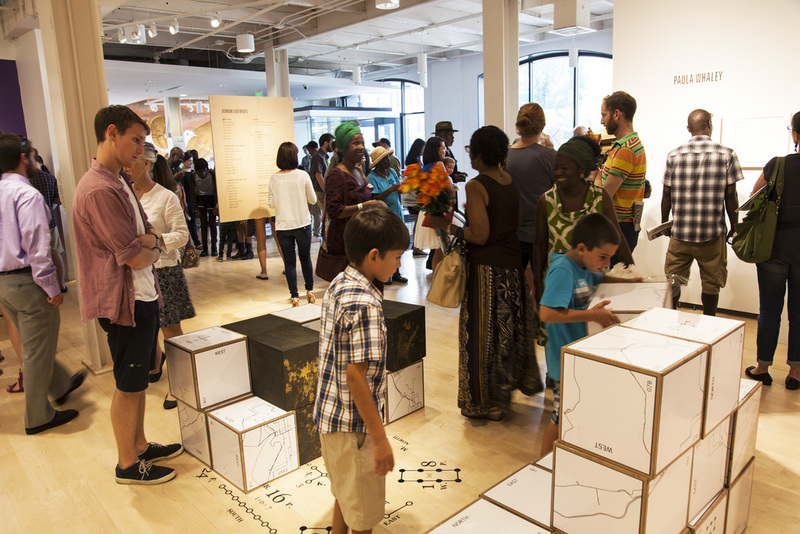 Each cube was stacked in a certain order to create a perfect cube, representing the interconnection of people in the neighborhood. An installation shot of final artwork by Jason Hoylman. Maps representing the paths of his neighbors, and their journals on a pedestal. Journals were kept by project participants to record their movements through the neighborhood. The resulting paths were mapped by Holyman to create a continuous image of their movements. The cubes were another interactive part of the exhibition, visitors moved them around to make new shapes. Visitors reading the Locally Sourced newspaper. Visitors examining Hoylman's map of Station North and greater Baltimore. Welcoming visitors and thanking artists and collaborators on behalf of the class at the opening. Over 400 visitors attended our opening reception! Visitors contributing to the interactive wall asking about their associations to the neighborhood. Click to view more photos from the opening reception. Baltimore's City Paper published a review of the exhibition: "In effect and in presentation... Locally Sourced is as much about the curators’ engagement with the community as the artists’...this particular display effectively highlights the overlooked reality that Station North is not about one group of people—like all urban communities, it’s composed of and propelled by people from all walks of life. In a world where many gallerists and curators often neglect their immediate community, it’s encouraging to see this group of young curators starting their work with this kind of outreach." LOCALLY SOURCED explores how exchanges between local artists and their neighbors help a community thrive. Five artists based in central Baltimore’s Station North Arts and Entertainment District—Aaron Henkin & Wendel Patrick, Jason Hoylman, NETHER, and Paula Whaley—showcase newly commissioned works in a variety of media. Through sculpture, sound, photography, painting, and installation, these artists offer different perspectives on the vibrant and interconnected cultural landscape of the arts and entertainment district. Curated by the Maryland Institute College of Art’s (MICA) M.F.A. 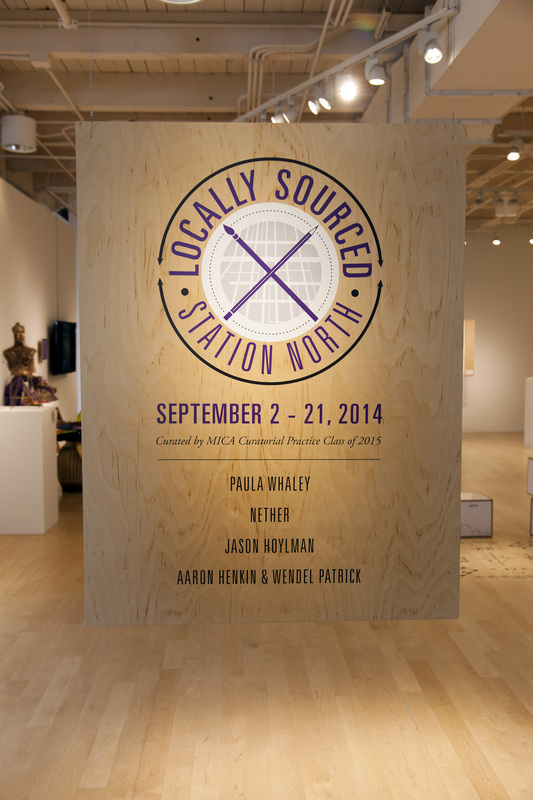 in Curatorial Practice Class of 2015, LOCALLY SOURCED goes beyond looking at the artwork itself by examining local artists’ social roles and contributions they provide to the neighborhoods they work within. The selected artists are not all activists, nor do they all create specifically community-based projects. But their awareness of and engagement with their communities are essential to their working methods. In the process of making their work, all of the artists grow networks of people around them, which in turn contribute to the success of their work.